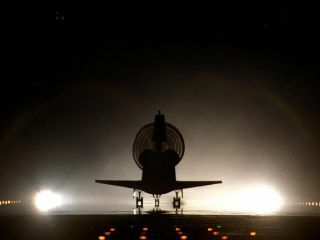 With its drag chute fully deployed, space shuttle Discovery lands on Kennedy's brightly lighted Shuttle Landing Facility runway 15, completing the 9-day, 19-hour, 13-minute and 1-second STS-96 mission. Main gear touchdown was at 2:02:43 a.m. EDT June 6, landing on orbit 154. This was the 94th flight in the space shuttle program and the 26th for Discovery. This image was taken June 6, 1999. One of the most enduring images of human spaceflight – in science fiction and reality – is that of a winged spaceship built to soar through the cosmos and return to Earth like an airplane. "Some of it is pop culture stuff – things like Buck Rogers – but we see this space plane concept throughout history," Roger Launius, space history curator at the Smithsonian's National Air and Space Museum in Washington, D.C., told SPACE.com. "We have this long-standing belief that coming back on wings, and using wings for flying into space, is the right way to go. And we haven’t abandoned that yet." NASA's space shuttles will retire this year after two more missions, capping 30 years as the world's only reusable spacecraft capable of ferrying humans to and from Earth orbit. The first shuttle launch blasted off on April 12, 1981. "Using a winged vehicle allowed Scaled to capitalize on the operational and safety advances that aviation has developed over the last 100 years," Whitesides told SPACE.com. Between airplanes, existing suborbital space planes, and the veteran space shuttles, humans have a long heritage of exploration and travel on wings. At the National Air and Space Museum, Launius is working on a new exhibition that examines the period of human spaceflight following the moon landings. One of the sections is about space access, how the space shuttles came to be, and what possibilities are in store for the future, Launius said. "When we started looking at this, we started to go back and trace this idea of a winged, reusable space plane," Launius said. "It goes all the way back to very beginning of the 20th century, and it's dominant in the thinking." In the 1930s and 1940s, a German aerospace engineer named Eugen Sänger was working on a project known as the Silver Bird. It was essentially a suborbital space plane that would be used for military defense. "In theory, it could bomb the United States from Germany by going up to the edge of the atmosphere, skipping off the top of it, and coming over New York," Launius said. "These kinds of ideas are dominant up until the 1950s." Winged spacecraft are also steeped in the history of the space race between the U.S. and the Soviet Union. "If you look at the Von Braun designs for vehicles to go up into space before Sputnik, he's talking about space planes," Launius said. "They throw the concept overboard because of the expediency of trying to deal with the space race with the Soviet Union. But, no sooner is the space race over, and we're right back to a space plane concept, which is what the shuttle is." So, what lies in store for the future of spacecraft design? "In the near term that will be up to NASA, as it considers what it will invest in to replace the space shuttle," Whitesides said. "Longer term, we think winged vehicles will make sense for highly reusable spaceflight vehicles to and from Earth orbit. That is not to say that reusable capsules will not also be in efficient operation, just that we expect that winged vehicles will be part of the diverse range of space vehicles we hope to see in the future." And if the realm of pop culture and science fiction is any indication, the winged space plane concept isn't going away any time soon, said NASA's deputy chief Lori Garver. "No question, in the future, there's going to be vehicles that land again on a runway from space," Garver told SPACE.com. "Look no further than science fiction to see all the different types of vehicles – and many of them are based on the fact that we'll be going throughout the solar system."